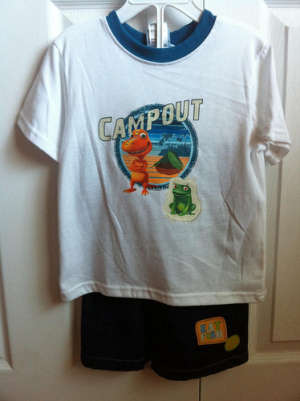 Dinosaur Train Apparel from Kids With Character! I cant get enough of these Dinosaur Train products. Adding clothing to the mix is just the icing on the cake! Sorry, can't keep an icing mess off of the shirts though. Each peice in the collection rocks a different Dinosaur from the show. There's also a cute little button down shirt not featured in the picture that gives the whole outfit a cute layered look. You can find these items now at your local Khols or Kmart.